If you are like me, you know how much of a nuisance a permanently attached dust cover can be. Our quick takedown pin can allow you to easily and securely remove and install the cover when you want. This new pin replaces the dust cover hinge pin on the Vepr 12 to allow for rapid removal. The design comes in handy for cleaning or other times you want clear access into the receiver without the dust cover being in the way. The pin is the same diameter as the original Vepr hinge pin, fits snugly into the original hole and has a ball bearing detent on one end to secure it. In the photo for this listing, you will see two pins. The slightly shorter in is our Yugo M85/M92 model that some Vepr 12 owners were using although it was too short and the ball bearing detent couldn't clear the cover. The longer pin is the one we are making for the Vepr. It will clear your weapon's cover no problem now. In case you are interested in using this pin for other weapons, the pin diameter is approximately 0.156" and the working length, meaning from the ring hole to just before the ball bearing detent is approximately 0.9". It's made from 303 series stainless steel with a black oxide finish and is plenty tough to serve as a hinge pin. Note, you will see photos of our pins that are silver - those were before we started making the pins with a black oxide finish on the pin and matching ring. 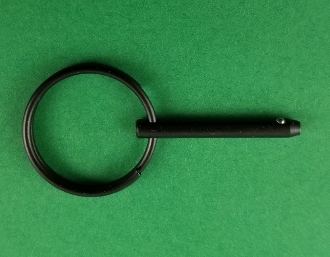 The ring is approximately 1" black oxide coated stainless as well. When the dust cover is closed, the pin is hard to remove due to pressure on the pin. When the dust cover is opened, and the pressure is released, it is far easier. This both helps secure the pin and the cover plus it makes takedown easier once the lid is open. There is an option to get one of each ring and you can then you can have both rings and decide which you like on the pin better. You install it by first removing your original pin. From what we have seen, the original hinge pin is staked. You will need to drill/mill or otherwise remove the staking and then drive the remaining pin out of the hinge. If you have the cover slightly opened, it will release the stress on the pin and make removing the original and sliding in our replacement pin easier. If you'd like to actually see the pin on a Vepr 12, visit this page done by one of our customers. I'd also like to thank Luis for his testing of the new pin and sending us photos! Also, Vepr12AllDay did a great video on how to install our pin. Click here for his video on Youtube. Please note we try to keep our current lead times for all orders on the home page of our website right under our main photo: http://www.roninsgrips.com. Please review this before placing your order.